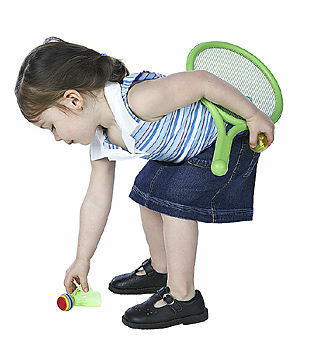 The tripod of kids’ physical health consists of sleep, nutrition and physical activity. This blog entry focuses on seven thinking traps we parents commonly engage in regarding the latter. #1 I don’t need to think about a daily dosing of physical activity for my kid. Recent research has suggested that obesity exists at alarming rates. For instance, a 2010 study published by the Journal of the American Medical Association, found that 10 percent of newborns and toddlers fall in the obese range with the number rising to 17% among ages 2-19 (one out of three were at the 85th percentile or higher). A lack of physical activity, together with problems with sleep and nutrition, are on a short list of causes for childhood obesity. This is why several authoritative bodies (i.e., the Centers for Disease Control and Prevention, the U.S. Department of Health & Human Services and the U.S. Department of Agriculture), have recommended that kids sweat and breath hard one hour each day (a 2009 national study by the Center for Disease Control found that less than one out of five teens is active at this level). #2 My kids’ level of physical activity is unrelated to my level of physical activity. There are few ways that a family is more connected than in the execution of health habits. My level of physical activity affects my physical wellness, mood, energy level and motivation, all of which impacts my capacity to parent with intention. Moreover, my level of physical activity models such behavior for my child and influences the proportion of family activities that are either active or sedentary. If you are struggling to get going try reading my blog entry on forming and keeping resolutions. #3 My kid needs to “exercise” in order to be physically active and that is too much of a battle or takes too much out of us in terms of time, cost or effort. The word “exercise” brings to mind images of a reluctant kid on a treadmill, with a chastising parent in the background. This is part of the reason why it’s better to use the term “physical activity” instead of “exercise.” This wording is broader in scope and less unpleasant in its implications. That said, I agree that it can be challenging to get big snowballs moving downhill, but once they get going things often become much easier. Moreover, keep in mind that if your child has a gym class or a sports related extracurricular activity he or she may already be engaging in a lot of physical activity. And, there are many easy ways to integrate more physical activity within your family life, as this download can illustrate. All this said, some kids need a discipline plan to do well. For a brief overview of the relevant issues, click here; for a more detailed and specific discussion regarding strategies, see chapter five of my parenting book, Working Parents, Thriving Families. #4 Kids need a lot of willpower to get recommended doses of physical activity. I’m not a big fan of willpower as a primary tool for improving and supporting adaptive health habits. For this reason. I think its important to minimize reliance on willpower whenever possible (e.g., see my blog entry on forming and keeping resolutions). That said, some degree of willpower is necessary for just about any worthwhile human endeavor. As psychologist Dr. Erich Fromm pointed out in his classic book The Art of Loving, if I do just about anything only when I feel like it, I will experience only compromised outcomes. Fortunately, this month The American Psychological Association published useful survey research on willpower, together with a helpful list of self-help articles for strengthening and supporting it. For these resources, click here. #5 Physical activity is fine, once required activities have been completed and we have the time for it. When someone represents this thought I suspect that she or he has not been made aware of the research indicating the significant consequences that are associated with a lack of physical activity, even when a child is not overweight (see the next point). Moreover, physical activity can nicely break up a day that might otherwise be filled with high doses of duty and obligation (e.g., academics, chores). I wouldn’t say “nutrition is fine, once required activities have been completed and we have the time for it.” The same thing is true regarding my kid’s physical activity (and sleep). #6 The consequences of not being physically active only catch up with people in adulthood. So we have some time. This is simply not true. Not only is obesity at risk (which comes with its own collection of adverse outcomes), but kids who are physically active have better moods, concentrate better, are more engaged with their families, have higher self-esteem, are socially more effective and are at reduced risk for an assortment of medical and psychiatric maladies. Indeed, being physically active is a primary resilience variable. This is why I focus on it in my parenting book as well as in my personal life (e.g., I’m a devotee of Tony Horton’s P90X programs, my three kids do a combination of 10 different sports activities throughout the year). #7 This is hopeless. All I’ve tried has failed. I just need to live and let live when it comes to my child’s physical activity. Hopelessness with this issue is never warranted, at least in every instance that has crossed my eye line. If you’re having these kinds of thoughts I’d recommend seeking out the services of a good child mental health professional. To find someone near you, click here. › Newer Post Can parents trust movie, television and gaming ratings?